Some 20 years ago during the Yeltsin era, within the chaos of Russian hyperinflation and IMF “shock therapy,” the Russian Orthodox Church introduced a similar proposal for interest-free banking as an alternative. During that time a gaggle of liberal pro-free-market Russian economists around Yeltsin, such as Yegor Gaider, prevailed. They instead opened Russia’s state-owned assets to literal plunder by western banks, hedge funds and corporations. In my first visit to Russia in May 1994 to give a talk at a Russian economic institute on IMF shock therapy, I saw first-hand the lawless mafia, russkaya mafiya, speeding through the near-empty Tverskaya Street near Red Square in new state-of-the-art Mercedes 600 limos without license plates. It was a devastating time in Russia and Washington and the technocrats at the IMF knew exactly what they were doing to foster the chaos. By 2014 much has changed in Russia. Most significantly, the infatuation with everything American of two decades ago has understandably vanished. The US Treasury financial sanctions were launched in stages in 1914 against specific individuals around President Putin, specific banks and corporations dependent on foreign credit. They had the effect of forcing a critical rethinking among Russian intellectuals, government officials and in the Kremlin itself. The Washington attacks, legally-speaking acts of warfare against a sovereign nation, were initiated by the US Treasury’s Office of Terrorism and Financial Intelligence, the only government finance agency in the world with its own in-house intelligence agency. The Office was created under the pretext of going after and freezing the assets and bank accounts of drug cartels and terrorists, something it seems strangely inept at if we judge from their record regarding groups like ISIS or Al Qaeda in Iraq. It seems to be far better going after “undesireable” countries like Iran and Russia. It has offices around the world, including in Islamabad and Abu Dhabi. Those US Treasury financial warfare sanctions and the prospect of much worse to come have sparked a deep debate within Russia on how to defend the nation from more attacks. Vulnerability to western sanctions in their banking system has led Russia, like China, to develop an internal Russian version of SWIFT interbank payments. Now the very nature of money and its control is at the heart of the debate. In January 2015, in the depth of the financial crisis, with a Ruble at half what it had been months earlier and oil prices in a free-fall as a result of the September 2014 John Kerry-King Abdullah agreement, the Moscow Patriarchate reissued its idea. Dmitri Lubomudrov, the Orthodox Church’s legal adviser told the media at that time, “We realized we couldn’t stay dependent on the Western financial system, but must develop our own. As with the Islamic system, the Orthodox one will be based not just on legislation, but on Orthodox morality as well, and will be an invitation to businessmen seeking security at a time of crisis.” Among its features would be interest-free credit issuance and prohibition of investment in gambling casinos or such activities going against Church moral values. Then in early August this year the Orthodox plan for interest-free money creation gained a major added support. Sergei Katyrin, head of the Russian Chamber of Commerce and Industry, after meeting with Vsevolod Chaplin, the senior Orthodox cleric overseeing the project, announced, “The Chamber of Commerce and Industry supports the creation of the Orthodox Financial System… and is ready to provide its platform for detailed and professional discussion of these questions together with the relevant committees of the chamber.” The proposal is aimed at reducing Russia’s reliance on the Western banking system, an essential national economic security requirement. Much as with Islamic banking models than ban usury, the Orthodox Financial System would not allow interest charges on loans. Participants of the system share risks, profits and losses. 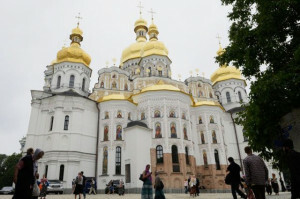 Speculative behavior is prohibited, as well as investments in gambling, drugs and other businesses that do not meet Orthodox Christian values. There would be a new low-risk bank or credit organization that controls all transactions, and investment funds or companies that source investors and mediate project financing. It would explicitly avoid operations with active financial risks. Priority would be ensuring financing of the real sector of the economy, its spokesman stated. Interestingly, Russia’s largest Islamic autonomous republic, Tatarstan, recently introduced Islamic banking into Russia for the first time and it was supported positively by German Gref, CEO of the state-owned Sperbank, Russia’s largest bank. This May, Gref called it a very important instrument amid the current problems with raising funds on international markets. In July Sberbank and the Republic of Tatarstan signed an agreement on cooperation in the field of Islamic financing. Under Czar Alexander III and his Finance Minister Nikolai Bunge, Russia established the Peasant Land Bank in the beginning of the 1880’s to give interest-free loans to the liberated peasantry that had been freed from serfdom in 1861 by his father, Alexander II and given land. The Land Bank invested in the modernization of Russian agriculture with farmers only paying a small handling charge for credits. The result was such a spectacular rise in Russian wheat, and other cereals that Russia became the world “bread basket” up to outbreak of World War I, exceeding the combined production of the USA, Argentina and Canada by some 25%. The new prominence of the Orthodox Monetary model in Russian discussions comes at a time when one of Vladimir Putin’s economic advisers, Sergei Glayzev, the person advising the President on Ukraine as well as relations with fellow-members of the Eurasian Economic Union, has presented a plan for enhancing Russia’s national economic and financial security under the quite sensible assumption that the financial sanctions and now military pressures from Washington and NATO are no whimsical accident but a deep-seated strategy of weakening and economically destroying one of the two nations which stand in a way of a globalist US New World Order. interbank information exchange system, analogous to SWIFT, for payments and settlements within the Eurasian Economic Union and other partner countries. Nabiullina has come under criticism from members of the Duma for being far too slow in building the gold reserves of the ruble. Russia today is the world’s second largest gold producer after China, and China has been building its Peoples’ Bank of China gold reserves in recent years at a feverish pace. Western central banks, led by the Federal Reserve, since gold backing for the dollar was abandoned in August, 1971, have done everything, including brazen market manipulation, to discourage gold currency reserves around the world. Most recently, on September 15 Glazyev presented a new series of economic proposals to the Presidential Russian Security Council to, as he stated it, reduce the vulnerability to western sanctions over the coming five years and achieve foundations for long-term growth and economic sovereignty. Among his proposals were creation of a State Committee on Strategic Planning under the President of the Russian Federation, together with a State Committee for Scientific and Technological Development, modeled on a system created in Iran during the 1990s following the introduction of Western sanctions there. The first measure, creation of a Committee on Strategic Planning, echoes the highly successful French national Planification model introduced under President Charles de Gaulle, that was credited with transforming France from a stagnant peasant-dominated economy to an advanced, innovative modern industrial nation by the early 1970’s. In the 1960’s France had a General Commission of the Plan which surveyed the entire economy to identify critical weaknesses that needed attention for overall national development. They would set goals for the coming 5 years. General Commission members were senior civil servants consulting with business leaders, trade unions and other representative groups. Each proposed plan was then sent to the national parliament for voting approval or change. The crucial difference between France’s 5-year Planification and the Soviet 5-year central planning model was that the French was indicative and not imperative as was the Soviet Five Year Plan. Private or state companies could freely decide to focus on a sector such as railway development knowing the state would encourage the investment with tax incentives or subsidies to lower risk and make it attractive. It was highly successful until the mid-1970’s when the massive oil shocks and increasing Brussels supra-national rule-making made it increasingly difficult to implement. There are other features to the detailed Glazyev proposal, among the most interesting his proposal to use Central Bank resources to provide targeted lending for businesses and industries by providing them with low interest rates between 1-4 percent, made possible by quantitative easing to the tune of 20 trillion rubles over a five year period. The program also suggests that the state support private business through the creation of “reciprocal obligations” for the purchase of products and services at agreed-upon prices. Russia is in a fascinating process of rethinking every aspect of her national economic survival because of the reality of the western attacks. It could produce a very healthy transformation away from the deadly defects of the Anglo-American free-market banking model.